I use vanilla extract in practically all of my homemade desserts and I have never been particular about the brand. If it’s vanilla, I will buy it. And if I can buy it in bulk, even better. But when I saw this recipe for homemade vanilla extract in the archives of one of my favorite food blogs, Tiny Test Kitchen, I had to give it a shot. The recipe is so simple with only 2 ingredients (that’s right, I said 2) and I would just need the patience to wait for the flavors to age and develop. So I dug deep and found the patience, which is never easy for me, and it was totally worth it! I split four of the vanilla beans lengthwise down the center. I then scraped the seeds out of the remaining three beans, discarded the inside and saved the pods for the mixture. 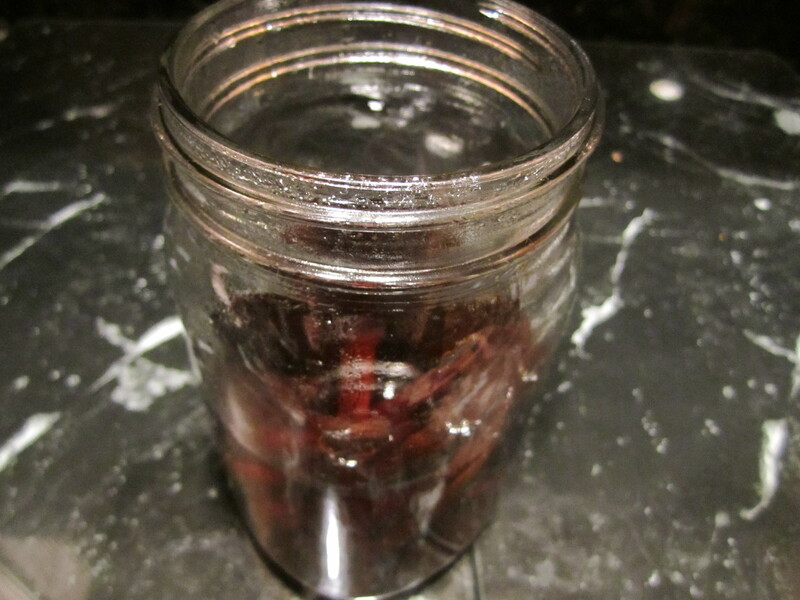 I placed all of the beans in a glass sealable jar and poured the vodka directly over the pods until covered. I sealed up the jar until airtight and shook it vigorously. I then placed it in a cool, dark place (cabinet above the fridge in my kitchen, right by my Zach’s lollipops) for 3 months. And that’s it! 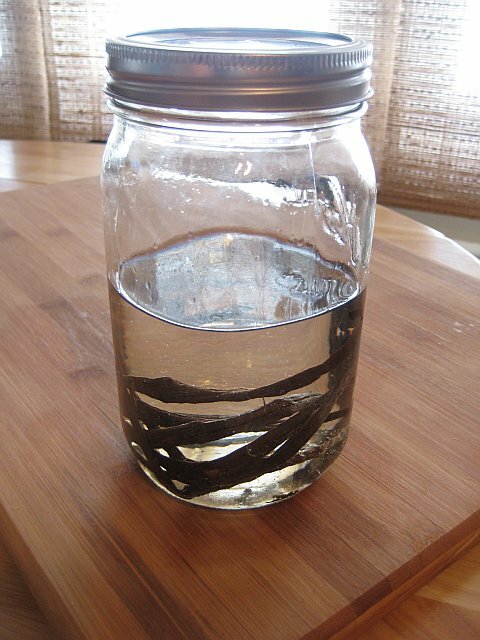 Now you just have to wait 3 months and your vanilla will be ready. So that’s what I did. I waited for 3 months and used up whatever store-bought vanilla extract I had left. And here are the results. Check out that golden caramel color. One cool thing to know is when the vanilla is running low, you can just add more vodka, shake it up, and let the mixture steep and age again. 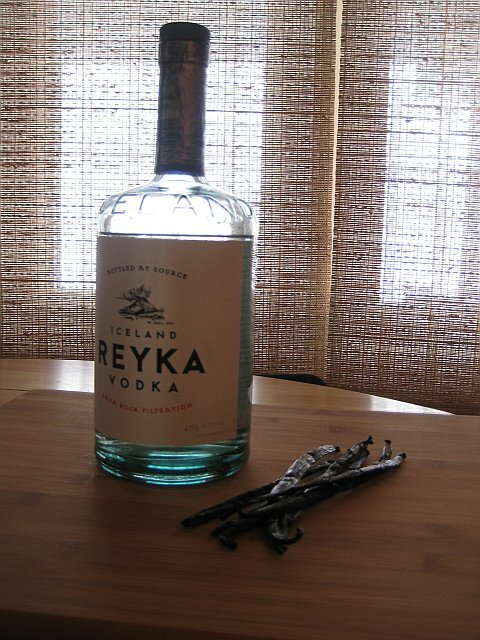 It’s the never-ending well of vanilla extract! Why would anyone ever pay for vanilla extract again?!? You are the best!!! and so interesting..and fun…Yaay Mel! It sounds quite interesting. I am going to try it. When you need more you don’t have to add more Vanilla? 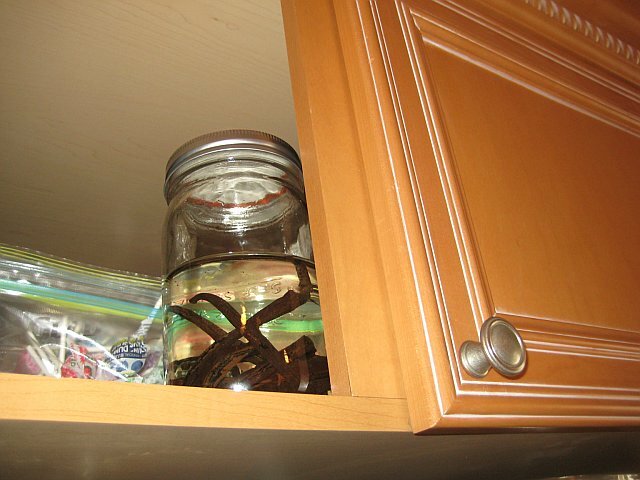 Also, What did you save the pods for that you scraped the Vanilla Bean from and did not put into the jar? I updated the description. You scrape out those pods, discard the inside and save the pods for the extract. Does that make more sense? So, I want to try this, too cool! Question, you split open 4 and placed them in the jar. Splie open 3, scraped out the seeds and put the seeds and the shell in the jar? And, is there some point when you should stop adding vodka to replenish and start over? TY!! I realized that my description was not great. You scrape out 3 of the beans and discard the inside. You then put the empty pods in the jar, along with the 4 split beans. Since this is my first time making it, I’m not sure when you should stop replenishing the vodka, but I imagine it would take a while to get to that point. I would replenish the vodka at least one more time, maybe twice. That description is much better. I would use the discarded vanilla for vanilla sugar. I will have to find a recipe but I am sure you only use the inside of the bean. Thanks! I can’t wait to try it…and then be able to use it by…Rosh Hashanah…? That’s so far away!! !